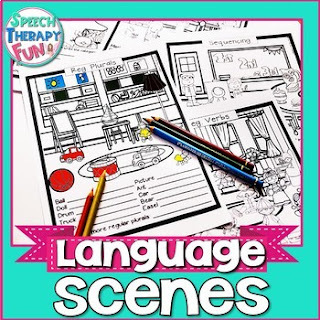 No prep language scenes are perfect worksheets for grab and go therapy! Students can find the pictures in the scene, complete the language task and then color them! There are a variety of scenes, so your students won't get bored! Plus, this set includes 22 no prep worksheets! Each scene contains 10 words and pictures. There is also an area for students to come up with their own words! *These articulation scenes are a part of the Speech Therapy Plans membership Get $45+ of therapy plans and materials per month! Perfect for SLPs who don't have time to plan! Click here for more of my products!